It all started with The Dragon's Gift: The Sacred Arts of Bhutan, a unique exhibition that traveled the world illuminating not only Buddhist art but also the cultural preservation of this unique Himalayan Buddhist kingdom. Since 2005, I have been living in Bhutan two months a year, sharing with a group of monks my expertise on how to restore their old and damaged thangkas. We brought the monks to The Honolulu Academy of Arts, so they could train one-on-one with and work alongside western conservators, gaining a wider per­spective on both the methods and importance of art conservation. Since those days the monks have learned to sew and repair the old silk brocades that border the thangkas. When the borders were too dam­aged, they learned to use natural dyes to make new silk take on the look of the original brocade. Clean­ing thangkas is a delicate task. Over time the monks have learned not to over-clean, so as not to lose the character and patina of the original art. When a thangka has too many tears, they now know how to back it up with very fine silk. Painting the damaged and missing areas on a thangka is never easy; the monks know when to stop painting to preserve the image properly. My goal has always been not just to train this first generation of monk conservators, but also create a tradition of conservation that they can pass to subsequent generations. 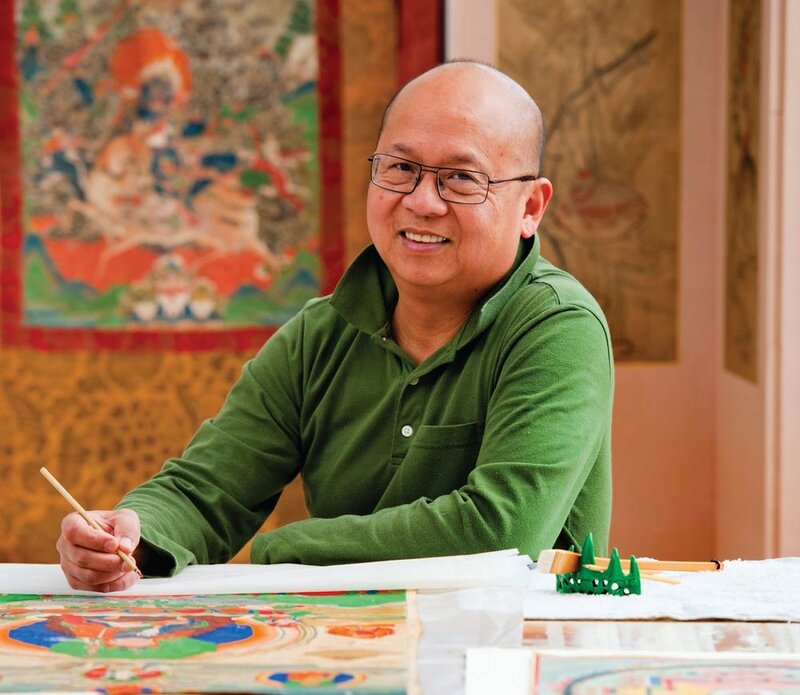 Who better to restore sacred reli­gious art but the monks themselves? The Central Monastic Body of Bhutan has given land to build the first conservation studio for the monks. This center will be dedicated to restoring damaged thangkas from all the temples in the country. This center will also serve as a train­ing facility for the next generation of monk conservators. The conservation workshop, which currently occupies a few temporary rooms in a small building in Thimphu, has restored more than 400 very important thangkas. From 2008 to 2010, 65 of these restored thangkas were exhibited in The Dragon's Gift exhibition. Conservation of religious art is a new concept in Bhutan. The monks will learn to handle, store and preserve their thangkas for future generations of Bhutanese, and for trainees, curators, consultants and educators from all parts of the world to better understand and appreciate Buddhism. We will all secure the destiny of this wonderful legacy from the past and keep it alive.